French Copper Black Marans have been selectively bred for their utility qualities and more specifically for egg colour and size. They are an ideal breed for keeping in your back garden, being exceptionally docile and calm. Through our very careful & selective breeding at redruthpoultry the maran hens are laying amongst the the largest and darkest brown eggs you will come across. The egg size/colour will of course vary, and cannot be guaranteed. You can expect them to keep laying for at least five to eight years. 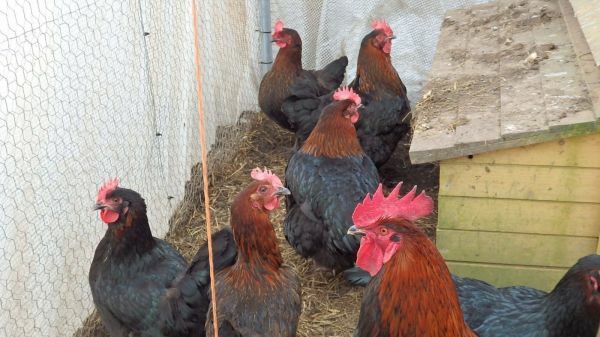 .The Black Copper French Marans are described as one of the more complexly-colored roosters. The male represents a copper shade that will be continuous across the head as well as the hackle which is the sides and back of its neck. A copper shade that is darker will appear on the swoop of the back or saddle, along with a combination of the darker copper shade and black feathers moving towards the area of the wings. The tail as well as the lower regions of their wings should consist of only black feathers that present a green prominent sheen. Underneath the wings and the chest will also consist of black feathers, but these areas will not have or have a slight sheen compared to the tail and the wings.The FemaleThe female Black Copper French Marans will have nearly a complete black body along with a copper shade on the neck and the head. These areas should have a very intense copper color. They are sweet natured beautiful birds•They lay rich, deep, chocolate colored eggs•The Disadvantages Of The Black Copper French Marans•Some of the variants of this particular breed will not lay eggs that are chocolate brown in color•Roosters have been known to be somewhat aggressiveCommon Characteristics Of The Black Copper French Marans•Weight: The hen 6.5 and the rooster •Origin: The Marans first originated from France•Purpose: The Marans serve a dual-purpose•The Egg Color: These chickens typically lay Chocolate Brown eggs. This particular color is possible from a coating that occurs in the last portion of the chicken’s laying process. Due to the fact that this coating is applied only onto the surface of each egg, it can be washed or rubbed off.•The Egg Size: Marans typically lay large to extra large eggs•Eggs Laid In A Week/Year: The hens typically lay around 3 to 4 eggs each week and around 150 to 180 eggs in a year.